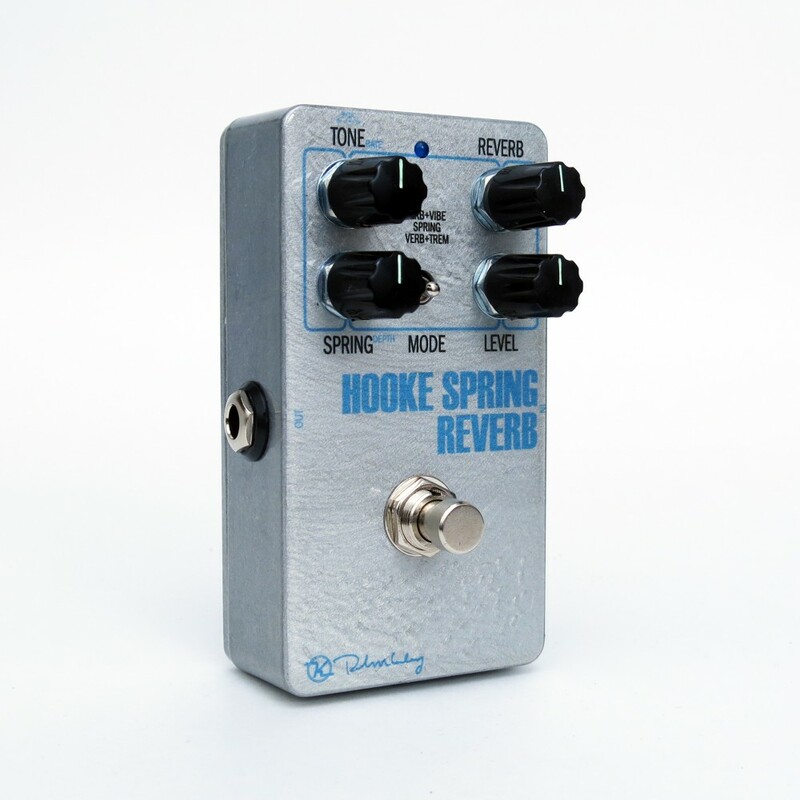 The new Hooke Spring Reverb from Keeley brings vintage tube-amp spring reverb and tremolo into one package. Bring your Blackface reverb and tremolo on the road with you without lugging around your prized possession! Choose from Classic Spring, Blackface Trem-n-Verb, or an organ-like Fugue-Verb. 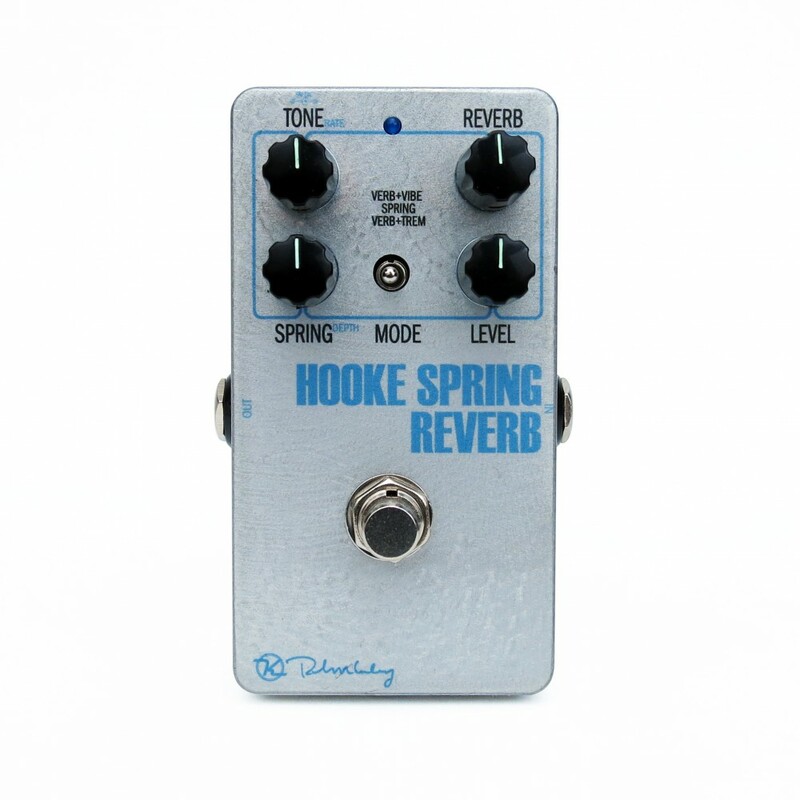 The Hooke Spring Reverb begins with a Spring Reverb mode. The main features of this mode include the Tone and Spring controls. The Tone control allows you to work within the range of bright and spanky to dark and thick. 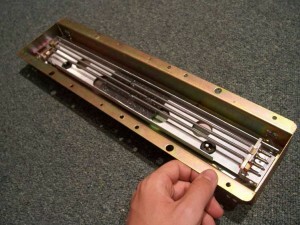 The Spring control is the amount “looseness” or “Sproing!” in the reverb pan. Loose springs seem to generate a lot of reflections, and you can hear the reverb “bounce.” With the Hooke, you can simulate a specific reverb pan of a vintage amp, two-springs, three-springs, short, medium, long decay … it’s all in there. What’s more, combinations of these two controls allow you to fine-tune the tone and the character of the springs and tubes in order to dial in your favorite vintage reverb response. 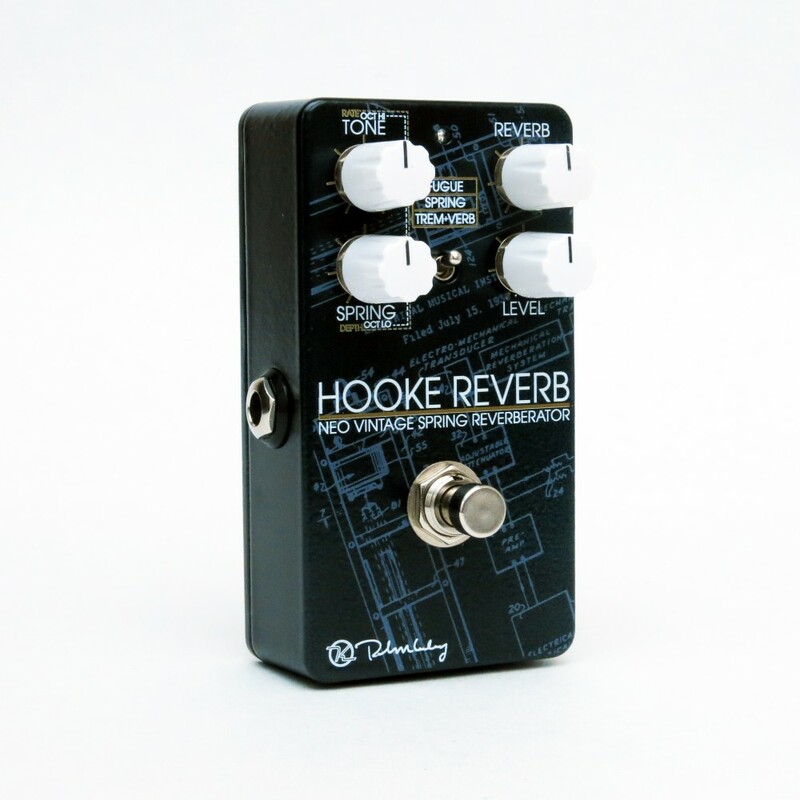 The depth and warmth of the Hooke reverb is simply remarkable. It’s one of our finest creations. Trem-n-verb is designed to give you the ultimate Fullerton, CA black panel Vibrato channel reverb. Everyone knows that it’s not really (pitch) vibrato, it’s tremolo. We carefully EQ’d and filtered the sound to not only be tube-like, but we crafted a tonal modification that makes for a deep, throbbing tremolo. By adjusting the bias of the output tubes for the volume tremolo, you also dip the volume of the reverb. We created a special recipe in which the reverb washes over the tremolo texture just a little thickened in order to craft a tone that is truly magical. The Hooke Reverb needed something crazy, something that just didn’t exist. We started playing with shimmer-springs, octave down and sprung, and all sorts of other coiled manifestations of things springy and coily when it hit us. The problem was we could hear the original guitar part. Ah, yes, all wet. All wet is where magic can happen. No original signal, all wet spring reverb with octave up and down. Church Organ, Organ Reverb, Fugue It! Get Hooked and Go Fugue! Spring Reverb: It’s all about that pan, that pan. 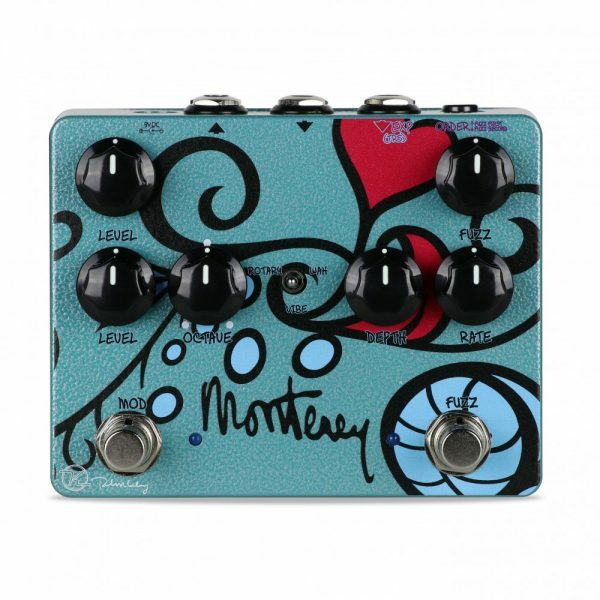 Want more from your Keeley Reverb? 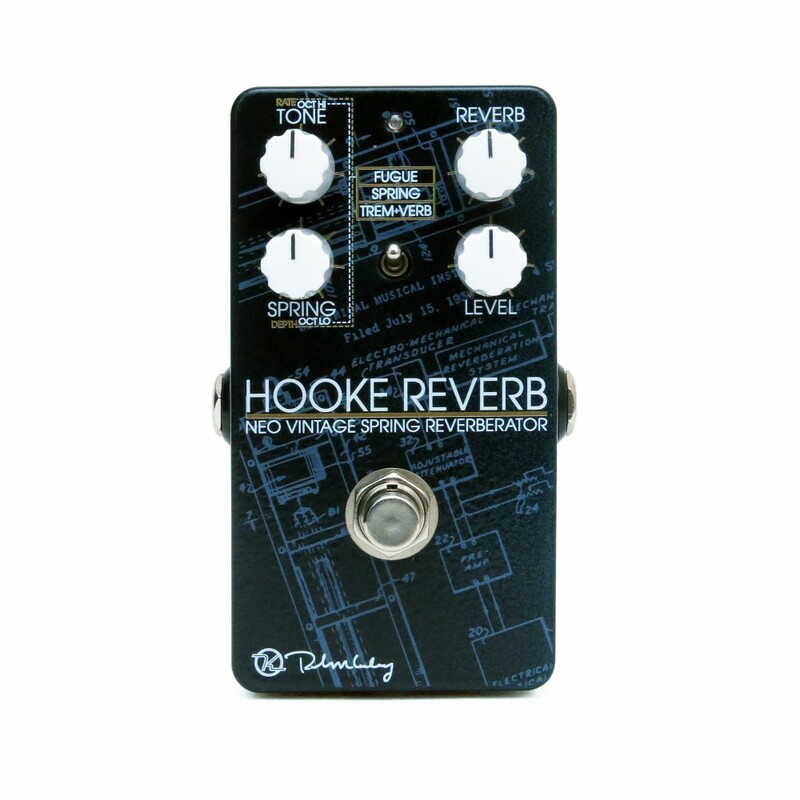 Take the back plate off your Hooke Spring Reverb and change the Bank Switch to Bank 2. Now you have three more spring reverb patches! Long Decay Trem-n-Verb – Same as in Bank 1, but set up for single coil guitars and super long decay/reverb trails. If you want a huge springy mess of reverb and you have some spaghetti logo guitar for making surf music … yeah, this is it. Spring’s up, dude! Spring-Plate – Another Keeley Original. After a YouTube commentator wrote, oh man no plate reverb? I said, Beeeeetch! I got your plate reverb! How about this, I said: Cross Fade between Spring Reverb and Plate Reverb. And that’s just exactly what it does. Dial in 25% spring reverb and 75% plate, dial in 50/50, dial in your own perfection. This is like taking your tube amp with spring reverb into the studio and then the producer adds plate reverb. Classic. Happens all the time. Well, now you can do it anywhere with the Keeley Hooke Spring Reverb. Thank you. Vibro-Spring – What if a Blackface and Magnatone amp had a love child? Yeah, a pitch vibrato spring reverb. Something that would have been right up Lonnie Mack’s alley? Well, it’s in there too. The Fugue Mode becomes what I call the Mack Mode. Mack Mode was inspired by Eddie Heinzleman’s love of Lonnie Mack. I texted Eddie about this possibility and in a few seconds I had YouTube links to Wham and Satisfy Suzie. Yup, Vibrato and Reverb. Sounds Delish. Mack ‘n’ Cheese! Wait, wrong page… Mack Mode! Spring Reverb with Pitch Vibrato. After you’re done ordering the Hooke Spring Reverb, stop by Eddie’s page please. He’s an amazing player. Eddie Heinzelman. Or on Facebook.